The food photography on the Jimmy's Famous American Tavern (JFAT) website is phenomenal. Before I visited this restaurant for the first time, I already knew I was going to enjoy my experience based on the food pictures and by reading the menu and food descriptions. Some of the menu items that made me drool are the jalapeno deviled eggs, warm homemade potato chips with blue cheese sauce, short rib hash (with tater tots, mind you), mussels and fries, and crunchy buttermilk onion rings with spicy chipotle ketchup. Oh, my stomach just growled! JFAT is such a simple name for a eatery. I find that the name is synonymous with downright home cooking that is comforting and delicious. Because JFAT is one of the contenders on my burger quest, I met two Twitter friends, @LorenaNR and @malou_nievera, to enjoy JFAT for the first time. Lorena is a friend and colleague of mine and Malou is a fellow local food blogger whose specialties are her delectable Filipino dishes. I met these fabulous women on a Sunday afternoon in Point Loma during JFAT's brunch time. Malou ordered the classic cheeseburger that comes with sharp cheddar cheese, red onion, lettuce, tomato, and JFAT's secret sauce... and a side order of crunchy cole slaw. All burgers have a side item choice of french fries, cole slaw, potato salad, or a simple green salad. JFAT burgers are HUGE! Lorena ordered a cup of their herbed organic tomato bisque and a half grilled 3-cheese sandwich. Looking at the menu now, it looks like they offer the "Jimmy's Combo", which they didn't have on the menu when we visited, for $10: cup of the tomato bisque, potato chips, green salad, and a half of a sandwich (grilled cheese, tuna melt, or a blue cheese slider). Awesome - my kind of combo. So many different flavors! This evening, I was craving a burger and ALL the ingredients that make up this piece of art sounded so delicious to me... Meyer Ranch All Natural Beef + melted gruyere cheese + french fried onions = JFAT's french onion burger. 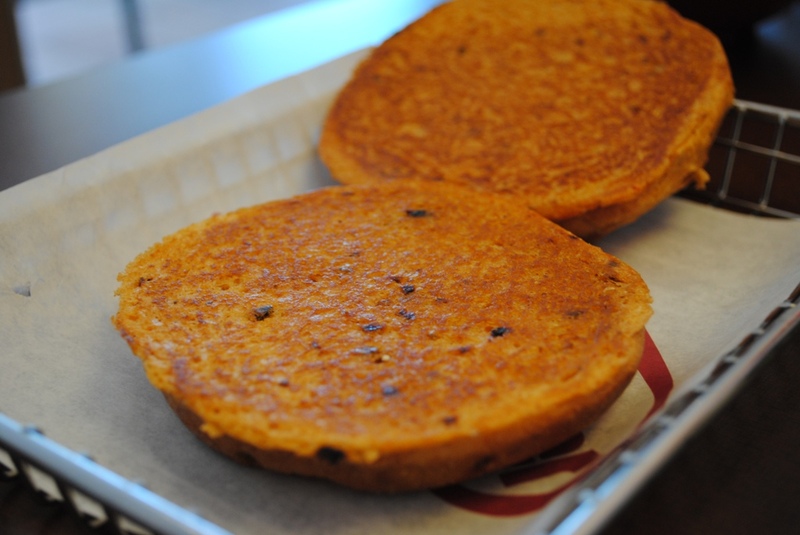 Oh, plus their buns... mmm, there's something about these buns that make me smile. Because I am a sucker for homemade potato chips, I substituted the french fries for these. The gruyere cheese was nicely oozing on one side of the juicy beef patty and the burger was piled high with crispy french fried onions. The brioche(?) bun was nice and soft... and warm. Oh, boy... was I in heaven!!! The potato chips were light and crispy. I forgot to mention that the chips come with a warm blue cheese sauce for dipping. *in heaven* I don't even think I really talked during dinner because I was heavily concentrated on my burger -- I was in a happy zone. Note: The french onion burger is no longer on the regular menu, but I sent a Twitter direct message to the staff at JFAT to inquire about the burger. They responded that since they have all the ingredients in the kitchen, the chefs may create it for you if you kindly ask. Yay! It has been quite a while since I have been back to JFAT. The menu has slightly changed from when they first opened, but everything on the menu makes me drool. I will surely be back for tater tots for Sunday brunch! Click on the JFAT events page for food specials like Sunday Champagne Brunch, Local Only Menu ($20 3-course meal), Jimmy's Combo, and Monday through Wednesday specials (all-you-can-eat honey buttermilk fried chicken!!!). My stomach just growled - again. I am very excited to let you all know that I wrote my first published food article in my community magazine, called "My Hometown Eastlake", December issue. Please click on the "Digital Archive" drop down menu and located the 'December 2010' issue. "Sharing Holiday Eats Often the Best Gift", is on page 21. When the opening of Smashburger in La Jolla resulted in a whole bunch of Twitter peeps to tweet about it, the hype prompted me to try and find the best burger in San Diego -- therefore, the existence of the Burger Quest 2010. Smashburger is clearly on my burger quest list, so when Junvi, DiegoOnaDime.com, invited me to be her date at the Del Mar VIP Opening of Smashburger Del Mar, it was the perfect opportunity to rate their classic Smashburger and french fries. What makes their hamburgers a true "Smashburger", according to their website, "Fresh, never frozen 100% Angus Beef [is] smashed, seared and seasoned on the grill." Nice. Junvi and I were both greeted by Dara of Elle Communications and she welcomed us to enjoy anything on the menu. The Elle Communications PR staff was very friendly (and fashionable, if I may add). PROPS to the Smashburger staff for letting Junvi know that they have a "no meat"option on the menu besides eating just the smashsides (which what she was going to do). They serve a black bean burger, which isn't on the San Diego menu online, but they do have one as an option. Junvi ordered the burger along with a side of veggie frites. Unfortunately, I didn't get a picture of the black bean burger. I tried a piece of her "meat". It tasted how I thought it would taste -- like black beans, which is a good thing because other restaurants try and 'mask' what the vegetarian item is supposed to be, like to try and recreate the taste of red meat using vegetables, whole grains, etc. I enjoyed the flavor. The veggie frites were not what we expected. Even though the menu description stated that they are 'flash-fried', I expected them to be lightly battered and then fried -- similar to tempura vegetables. They looked a little sad sitting on the silver dish when they were served to us. The vegetables were not crisp and "fresh looking" anymore. The asparagus was limp and tasted just okay. I would prefer the vegetables to be steamed to maintain its crispiness and "right from the market" look. The final thing I wanted to try were the fried pickles. I could not stop eating these. They were addicting and like potato chips where I couldn't eat just one. The pickles were fried to a perfect crisp. They overseasoned the pickles once they came out of fryer, but still... I kept taking one, dipped it into the cool ranch dressing and popped it into my mouth. Fried pickle after fried pickle. I was full from the Smashburger and Smashfries but I told myself that I was just going to have one more. And one more. One last one. OK, this one is it. We called it a night after chatting it up with the lovely ladies of Elle Comm, including the CEO, Ms. Danielle, and Relationship Coordinator, Dara. I invited my co-worker, Brian, to experience the new Smashchicken sandwiches with me. We headed over to the Hazard Center on a Tuesday evening after work. We arrived promptly at 6:00 PM when the event started and met Dara right outside of the restaurant. After she greeted us, Dara told us to order one of the new menu items, a side, and a drink at the counter. We also had to show the Smashburger staff our "media" menu upon ordering. Our plan was that we split each chicken salad and share the smashsides. Our orders arrived promptly and very quick. We received a nice portion of the haystack onions (which Brian apparently loved saying) and the stack was accompanied by a side of their onion ring dipping sauce. The grilled chicken breast on the Buffalo smashchicken was slathered by a thin layer of Frank's delicious buffalo sauce and TONS of crumbly bleu cheese. The chicken was cooked perfectly.... it was juicy. The only thing is that the bleu cheese overpowered all the flavors of the sandwich that I could only eat a couple of bites. The haystack onions were very delicious. Crispy, straight out from the fryer, with the right hint of salt.... nothing else to say about these babies. They were really good. Dara invited me to lunch at the Smashburger Mission Valley to try out a few of menu items that I did not get to sample at my initial two visits. We met for lunch on a lovely weekday afternoon. I also got to try out our new camera for food shots. Dara convinced me to try the Oreo milkshake as a special treat (and our appetizer since it came out before the food did). It was heavenly delicious. 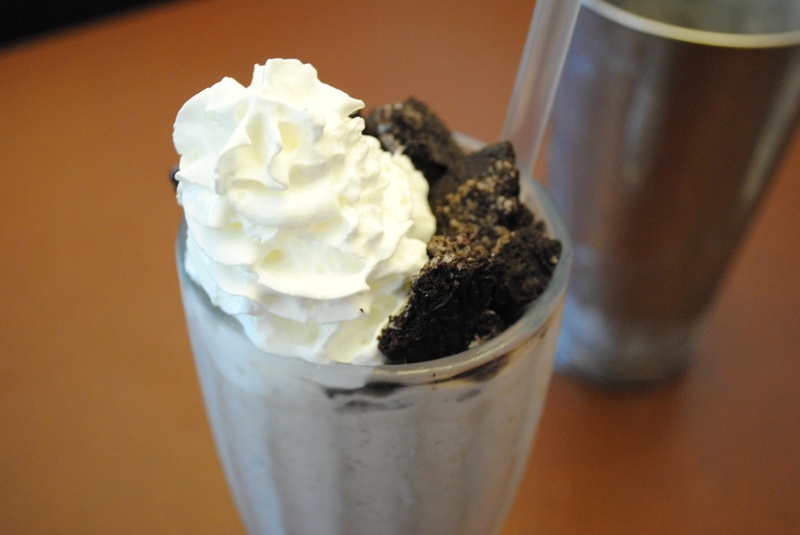 It was cold, thick and creamy and full of the Oreo flavor that I enjoy so much. 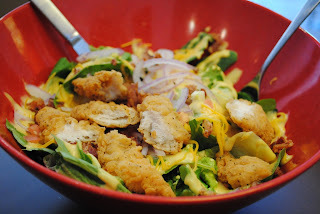 THIS was one of the main reasons we got together -- the honey mustard chicken smashsalad. I can eat this all day. Crispy chicken (you can get it with grilled chicken too), field greens, red onion, cheddar cheese, diced tomatoes, applewood smoked bacon, and their creamy honey mustard dressing. It was very filling and a great "lunch" salad for those on a go. This size was the full size and it was more than enough for sharing (since we had more food coming!). 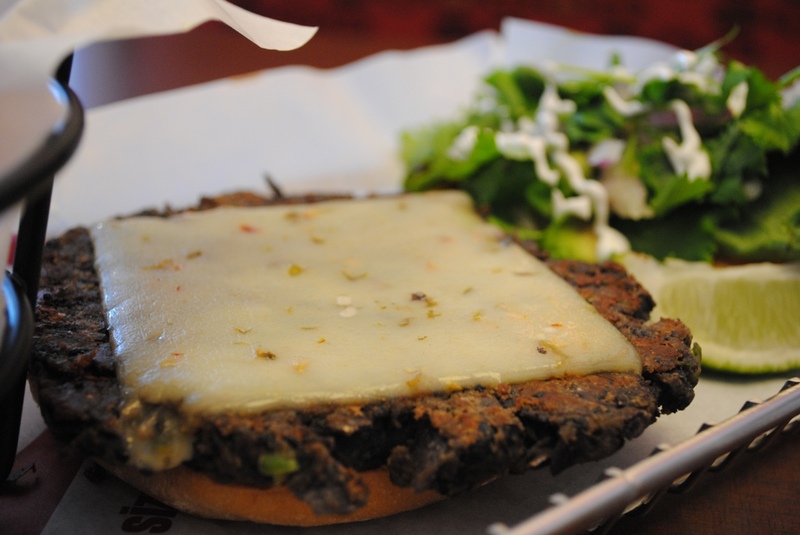 We both order the black bean burger with melted pepper jack cheese -- and San Diego style, per the recommendation of Dara. A San Diego style sandwich comes with fresh cilantro & onions, avocado, lettuce, and a drizzle of sour cream & chipotle mayo. The burger was really good. As I mentioned before [above at the Del Mar opening], I love the taste of black beans and what I was eating was a simple black bean patty. Combined with the flavors of Mexico, it was absolutely divine. I'd order this burger again in a heartbeat -- yes, coming from some who adores meat. Note: Dara pointed out to me that this burger is a "no meat" option and not a vegetarian entree since they grilled them on the same flat top as the burgers. The owner of all the Smashburger locations in San Diego sat and joined us for a while. He suggested that we try their spicy chipotle roll as a bun alternative for their smashburgers and smashchicken sandwiches. I took a bite and although it was very flavorful with spices, it was a bit too spicy for me. 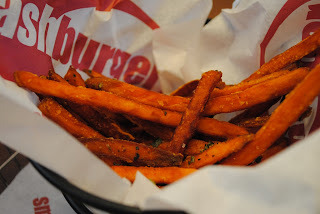 Our final taste were the sweet potato fries, which was one smashside I did not get to sample yet. No one can really mess up sweet potato fries and Smashburger surely did not. My reviews of Smashburger were definitely overdue. I personally would like to thank Elle Communications, especially Ms. Dara, for hosting such wonderful restaurant events. I look forward to more! I heart Jaynes Gastropub. There is something comforting about this place that makes me want to keep visiting. 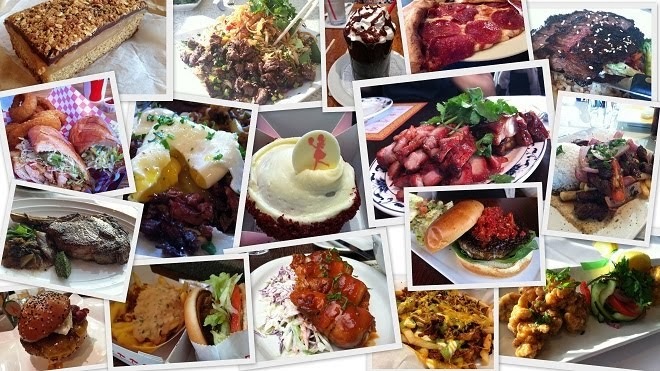 The restaurant is cute, quaint and located in one of the best foodie neighborhoods there is, North Park. I love the fact that I actually see Jayne herself running the restaurant, ensuring that everyone is taken care of. I love that they promote their specials via their website blog and other social media outlets, like Twitter (@jaynesgastropub - follow them). With that, I have visited twice with the same favorite buddies of mine, my hubby and our good friend, Q. This review is LONG overdue.... enjoy! Q, Mike and I celebrated the New Year by visiting Jaynes for the first time at the end of January 2010. Jaynes was a suggestion by Q who stated that this was the favorite restaurant of one of our former directors at our organization. As I reviewed the menu online (of course), the courses were simple and the descriptions made my mouth water. I love entree descriptions on menus. I was completely ready to experience something new! 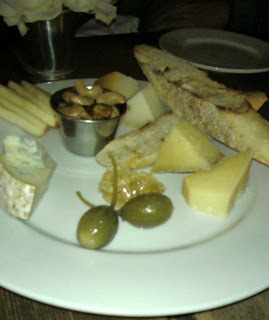 Q suggested that we start off sharing the artisan cheese plate that comes with a variety of fresh cheeses, grilled baguette, caperberries, honeycomb, crispy sliced apples, and a tiny tin cup of nuts. I forgot exactly what cheeses we sampled but I am certain there was white cheddar and a type of bleu cheese. It was the perfect start to our meal. There were two caperberries and three of us, so the guys ate one. I thought that it was some sort of olive, but nope, they actually are caper buds (same capers used in tartar sauce, with smoked salmon, fish dishes, etc) that are pickled. 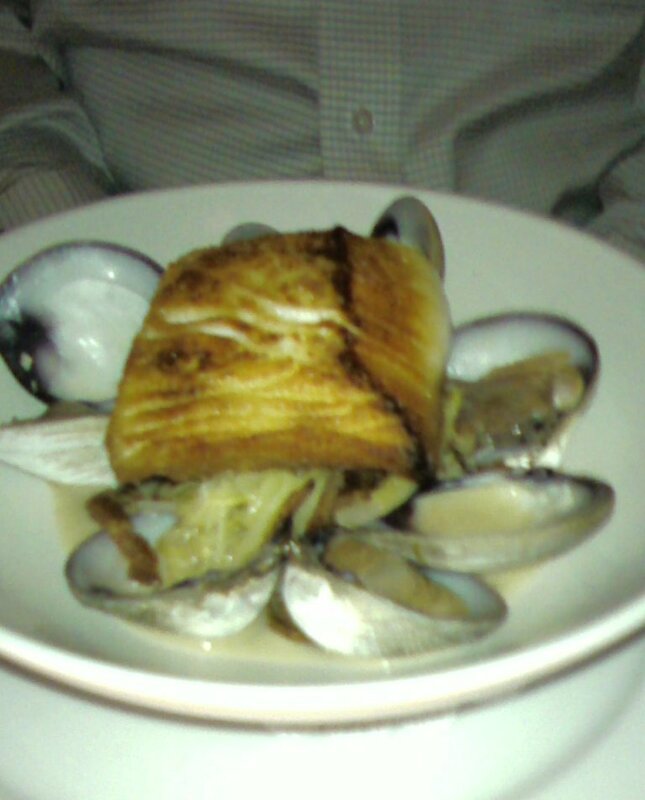 Mike ordered the fish & steamed clams for his dinner entree. Because it was over 10 months since we first visited, I forgot the name of the fish that accompanied the clams - *boo*. I do remember how the fish was cooked perfectly and was super fresh tasting. The clams in the broth were absolutely delicious and the broth had the right hint of saltiness to mimic "the sea". Yummers. 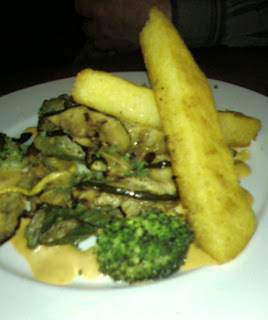 Q ordered the grilled polenta with fresh vegetables with a smoke pepper coulis. I had a bite of the polenta cake with the coulis and veggies. It was very good for a vegetarian dish. The polenta was "mealy" and I can see how the plate can be filling with the absence of meat. 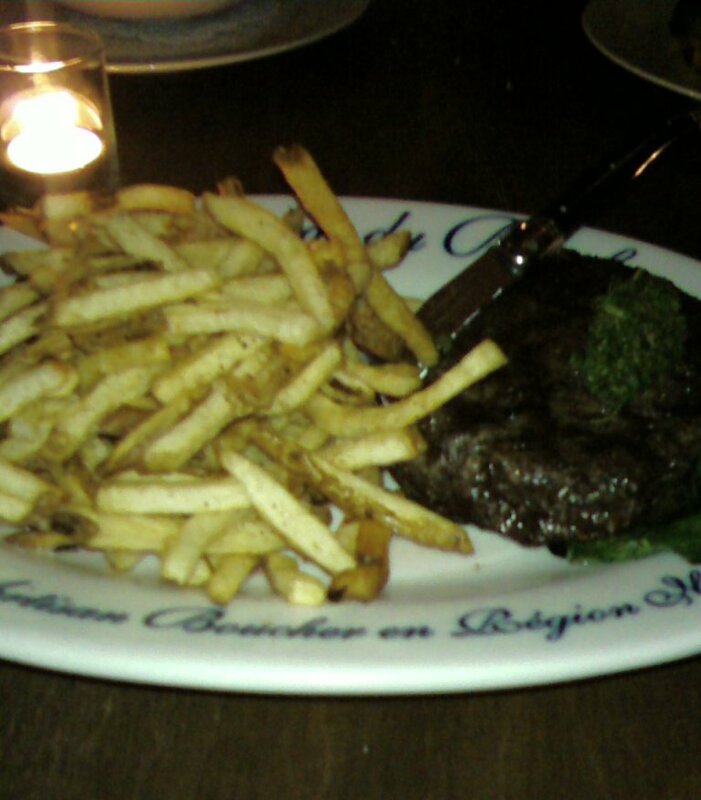 NOW, my dish... steak frites. Everyone who knows me knows that I'm all about meat, especially red meat. There's nothing like a good plate of meat and potatoes, especially with crispy french fries? Yes, please! Jaynes' steak frites comes with a Niman Ranch flat iron steak, frites, salsa verde (mixture of green, fresh herbs) and braised greens. The flat iron steak, aka top blade steak, was juicy and DELICIOUS. Because top blade steaks come from the shoulder of the cow, it is a very tender cut of meat. And... it sure was! The frites were not as crispy as I wanted them to be, but they still were fried potatoes that were good enough to keep my hungry tummy happy. It was a lovely July afternoon where Q, Mike and I returned to Jaynes with one goal in mind. BURGER QUEST CANDIDATE. Because I have not been reviewing the burgers on my quest list on my blog (I've been rating in secret), I will simply post pretty pictures of the Jaynes burger and review the other meals. We started off with the white bean puree + crostini that was accompanied by succulent house grilled peppers. The white bean puree reminded me of hummus because of the creamy consistency and the presence of a good olive oil. It did have a similar taste to hummus. Mmm, the puree simply melted in my mouth. The grilled peppers looked pretty in the dish - sweet red, orange, and yellow peppers were happily grilled and waiting for us to devour with the crunchy crostini and white bean puree. I made the perfect bite and took a picture before munching on it. Both of the flavors went well together. I enjoyed the crunch of every bite of the warm crostini. I took this picture to capture the name of the burger, but it just so happens that you can also see the menu items of what Mike and Q ordered. If I was not rating the burger this evening, I would have definitely gotten this lovely plate of food. Q ordered the sea bass fish and chips. Hot and crispy. I watched Q as he took his fork into the flaky fish and it "crunched." It was like music to my ears. I did not have a taste of his fish, but I did have a sugar snap pea that I believe, was sauteed in olive oil and garlic. Can I say that I can eat a whole bowl of these, like while I am watching a movie at home?? They were cooked enough to have the subtle flavor of garlic in every pea and kept the fresh taste and crunch. I absolutely loved these. Guests can order the sauteed peas as a side. Next time I go, they will most definitely be on "my side". The hubby ordered the pecan crusted albacore tuna that came with saffron scented Israel cous cous and a red pepper coulis. It was a perfect dish for a warm summer evening. It was a beautiful presentation too. I enjoyed the texture of seared tuna, especially with the pecans to add more contrast. The red pepper coulis was sweet and delicious. Ta-da... the Jayne burger. Niman Ranch ground beef, Vermont white cheddar, pickled onions, and garlic aioli. Another great meal at Jaynes. Because I subscribe to their blog, I have been tempted by their fried chicken, gourmet hot dogs, schnitzel with mac n' cheese, and the full, yes, FULL English breakfast that they now offer on Sundays. Unfortunately, I have yet to try all of these goodies, but I absolutely will in the near future. Hope all is well, Jayne & Jon -- thanks for everything! 1. "How long have you guys been here?" ...a few weeks. 3. "What does Bangkok Poco really mean?" ...kidding, I didn't ask this. When we visited, they ran out of salmon for the panang salmon dish (we ordered shrimp instead) and our server couldn't tell me what dressing was on the salad (and didn't care enough to ask). Maybe we got off the wrong foot, B.P. And so, I gave it another try.... *long pause* and another try. I went with my long-time friend, Pam, who I went to junior high and high school with. We often get together at least once every couple months to catch up on work, our personal lives, and "tsismis (gossip)" about everything. Bangkok Poco has lunch specials which range from $5.00 (tofu & vegetarian) to $7.00 (shrimp, beef). The process is the same as most Thai restaurants.... you pick your protein and they create your curry, noodle, or rice dish. Every lunch entree comes with a cup of soup, entree, mixed green salad with the mystery dressing, and a Thai egg roll. Pretty good deal, in my opinion. But, is the food worth it? We both started off with a cup of soup that had warm broth, cabbage, carrots, and a hint of ginger. It reminded me of two things: "nilaga (a Filipino beef soup sans the beef)" and "cabbage water" from the 1971 film 'Willy Wonka and the Chocolate Factory'. To quote Charlie Bucket in his squeaky little voice, "I'm sick of cabbage water... it's not enough!" For the most part, it reminded me of nilaga and I enjoyed it. The only thing it was missing was a little 'patis' (fish sauce). I don't even know what the soup is called. Pam ordered the chicken pad thai - level 5 spicy, I believe. They put a weird pile of chopped peanuts on the corner of the plate as garnish. I tasted a bite of Pam's pad thai. Mmm... I was impressed. It was really good and I thought it was better than Basil Thai's. I enjoyed the bean sprout crunch, the texture of the noodles, and the overall flavor -- including the spice! Pam also ordered a side of some Thai hot spice on the side, which they happily gave to her in a little dish - it was this complimentary condiment. But, I was put off that our server came by after 10 minutes and told her that they needed to take the spice away to give to another customer. Huh? I was determined to see if the chicken pad see ew here could be as good as Basil Thai. This noodle dish came with a lot of vegetables, like bok choy, broccoli (not Chinese broccoli), cabbage, and carrots. They also sprinkled some sort of Thai spice on top, which just like the garnish of peanuts on Pam's plate, I did not understand why. The flavors were just "okay".... I mean, good, but not amazing. The flavor of the broccoli didn't taste fresh so I left those on the side and didn't bother to eat the big chunks of raw carrots. The egg roll was hot off the fryer and had a delicious flavor. The mystery salad dressing is a pineapple dressing which goes very well with the mixed greens. Overall experience with the food and service... eh. After trying Pam's pad thai, I thought I'd give it ONE more chance. A couple of weeks ago, I went with my great friend, Ar, I ordered the shrimp pad thai with no spice.... DELICIOUS. The shrimp was perfectly cooked and most important, deveined correctly and thoroughly (yep, I inspect every single of them). I finally found my favorite dish here. Plus, they didn't put that weird pile of peanuts on the plate.